Monoclonal murine antibodies directed at human C5 were developed and screened for their ability to block activity of terminal complement components in a standard hemolytic assay. Murine antibody 5G1.1 was found to effectively prevent generation of chemotactin C5a and the formation of the membrane attack complex (C5b-9) and was successfully humanized, laying the groundwork for development of a clinically useful terminal complement pathway inhibitor.11 The US Food and Drug Administration approved eculizumab for treatment of paroxysmal nocturnal hemoglobinuria (PNH) and atypical hemolytic uremic syndrome (aHUS). Both PNH12 and aHUS13 are disorders of complement regulation. Based on their similar pathogenesis, C3GN and DDD were proposed as conditions that might benefit from eculizumab therapy. Theoretically, successful blockade of C5 in these glomerulopathies should both prevent C5a formation, resulting in less neutrophil and leukocyte infiltration, and inhibit formation of the membrane attack complex. Patient DDD1 experienced improvement in serum creatinine after a year of eculizumab treatment from baseline of 1.8–2.0 mg/dl to final creatinine of 1.3–1.4 mg/dl, with low levels of proteinuria throughout. His pretreatment biopsy showed that he had moderate mesangial proliferation, segmentally prominent endocapillary proliferation with leukocyte infiltration, and focal membranoproliferative features. Biopsy after eculizumab treatment showed persistent mesangial proliferation but resolution of the endocapillary proliferation and leukocyte infiltration (Figure 1). The degree of glomerulosclerosis and tubulointerstitial scarring remained constant with approximately 20% global glomerulosclerosis and 15% tubulointerstitial scarring (Table 1). Immunofluorescence staining patterns and intensity for C3 and C5b-9 were similar in the pretreatment and post-treatment biopsies, showing no significant diminution in staining. Although there was no evidence of Ig or light chain staining in the pretreatment biopsy, after treatment with eculizumab there was strong (2–3+) staining for IgG and κ light chain within glomeruli, tubular basement membranes, and vessel walls (similar in distribution to C3 and C5b-9), with no corresponding staining for λ light chain (representative staining shown in Figure 2). IgG subtype staining revealed 2–3+ positivity for IgG4, 1+ positivity for IgG2, and no staining for IgG1 or IgG3 (Figure 3). This new and unexpected staining pattern for IgG-κ with restricted IgG subtypes was identified in all of the post-treatment biopsies (Table 2). Electron microscopy showed electron dense deposits in glomerular mesangial, subendothelial, and intramembranous distributions, as well as tubular basement membranes (TBMs) and Bowman’s capsule. The post-treatment biopsy showed a mild decrease in the number and electron density of deposits in the mesangial and intramembranous regions (Figure 1D), whereas TBMs showed an increase in electron dense deposits (Table 3 and Supplemental Figure 1). After cessation of therapy, the patient experienced a progressive rise in serum creatinine to 1.7 mg/dl and was restarted on eculizumab 8 weeks after finishing the course of therapy. Patient DDD3 had recurrent disease diagnosed in his renal allograft 20 months after living related renal transplant. He experienced a decrease in proteinuria from a peak of 10.58 g/g to <0.3 g/g after 1 year of therapy. Light microscopy showed a mild decrease in mesangial proliferation and resolution of neutrophil infiltration. Although mild segmental sclerosing features and focal membranoproliferative features had developed in the post-treatment biopsy, tubulointerstitial scarring remained stable at 5% (Table 1). The pattern and intensity of immunofluorescence staining for C3 and C5b-9 were comparable in the pretreatment and post-treatment biopsies. The post-treatment biopsy was notable for similar deposition of IgG, κ light chain, and IgG2 and IgG4 subtypes as described above for DDD1. Electron microscopy showed a decrease in mesangial dense deposits. Laboratory values 4 weeks after cessation of eculizumab therapy remain unchanged. Patient C3GN1 did not show clinical evidence of a response to eculizumab therapy. The pretreatment biopsy was notable for significant disease chronicity with 50% global glomerulosclerosis and 40% tubulointerstitial scarring. In both the pretreatment and post-treatment biopsies, there was prominent mesangial proliferation with membranoproliferative features (Figure 1C). Despite treatment, fibrosis increased to 65% and glomerulosclerosis increased to 85% (Table 1). Immunofluorescence showed similar levels and patterns of C3 and C5b-9 staining. Again the development of IgG-κ staining with restricted γ subtypes was noted in the post-treatment biopsy (Table 2). Electron microscopy (Table 3) showed an apparent increase in subendothelial deposits, some of which had a punctate powdery texture similar to that seen in monoclonal Ig deposition disease (Figure 4). These powdery deposits were also noted in the intimal and medial basement membranes of small arteries in the post-treatment biopsy (Supplemental Figure 2). Patient C3GN2 had recurrent C3GN diagnosed in the renal allograft at 4 months post-transplant. He began eculizumab therapy 8 months later with elevated creatinine (1.7–1.9 mg/dl) and a UPCR of 4.4 g/g. His creatinine and proteinuria remained stable over the 1 year of therapy. The pretreatment biopsy showed prominent mesangial and endocapillary proliferation with abundant leukocyte infiltration. Post-treatment biopsy showed a decrease in both the endocapillary proliferation and leukocyte infiltration with a mild increase in chronic glomerular scarring and interstitial fibrosis (Table 1). Immunofluorescence revealed similar C3 staining in the pretreatment and post-treatment biopsies and again showed the development of IgG-κ staining with γ subtype restriction after eculizumab treatment. Electron microscopy showed a similar degree of deposit formation with the added finding of powdery subendothelial and mesangial deposits reminiscent of monoclonal Ig deposition disease, similar to those seen in patient C3GN1. Seven weeks after his last dose of eculizumab, the patient’s creatinine had increased to 8.4 mg/dl, requiring initiation of dialysis. Repeat biopsy after recrudescence showed a marked increase in glomerular endocapillary proliferation and neutrophil infiltration and the new development of crescents, consistent with reactivation. Notably, this is the only biopsy in the series that demonstrated crescent formation. He was restarted on eculizumab, and is showing ongoing improvement with the latest creatinine value of 3.3 mg/dl. Patient C3GN3 had recurrent disease diagnosed in his allograft 1 month after transplantation. He began eculizumab 3 months post-transplant with a creatinine of 1.8 mg/dl and no proteinuria. Creatinine decreased to 1.4 mg/dl by the end of therapy. Both the pretreatment and post-treatment biopsies showed mild mesangial proliferation with no evidence of endocapillary proliferation or exudative features, and minimal chronic scarring (Table 1). Immunofluorescence and electron microscopy findings (Tables 2 and 3) were similar between the two biopsies, with the exception of the development of IgG-κ staining with restricted subtypes in the post-treatment biopsy. Follow-up laboratory parameters 4 weeks after completing therapy remain stable. We present a detailed account of the pathologic findings in patients with DDD and C3GN before and after treatment with C5 inhibitor eculizumab. The clinical responses of the patients are provided in a companion manuscript.14 Clinical responses were variable with three patients showing evidence of clinical improvement either in the form of reduced serum creatinine (patients DDD1 and C3GN3) or remission of nephrotic syndrome (patient DDD3). Corresponding improvement in histology was observed in two of these patients, with repeat biopsy in patient DDD1 showing a decrease in leukocyte infiltration, endocapillary proliferation and membranoproliferative features, and patient DDD3 showing decreased leukocyte infiltration and mesangial proliferation. Histologic findings in patient C3GN3 were very mild on the pretreatment biopsy and remained unchanged, although he showed clinical improvement. Patient C3GN2 showed neither clinical improvement nor deterioration while taking eculizumab, but histology revealed a significant reduction in proliferative activity within glomeruli. Notably, 1 month after discontinuing eculizumab, this patient developed a severe reactivation of C3GN, which appeared to respond to reinstitution of eculizumab therapy. Patient C3GN1 had a slow clinical deterioration despite therapy, and this was paralleled by persistent histologic activity and a marked increase in chronic scarring on post-treatment biopsy. All post-treatment biopsies showed unexpected immunofluorescence findings. In contrast to the improvement in histologic activity observed post-treatment in three patients, the staining for C3 and C5b-9 appeared largely unchanged in the pretreatment and post-treatment biopsies. Whereas C3 is upstream of eculizumab and therefore would not be expected to be affected by therapy, eculizumab should inhibit formation of new C5b-9. Thus, the unchanged staining for C5b-9 observed post-treatment may be due in part to its long t1/2 when bound to extracellular matrix, reflecting pretreatment levels of deposition. Notably, normal kidney biopsies (Table 2) showed mild to moderate (1–2+) C5b-9 staining within glomerular mesangium and some glomerular capillary walls and Bowman’s capsules, with moderate patchy to diffuse staining within TBMs and prominent arterial and arteriolar wall staining, despite the absence of any light microscopic or ultrastructural abnormalities (Figure 5). 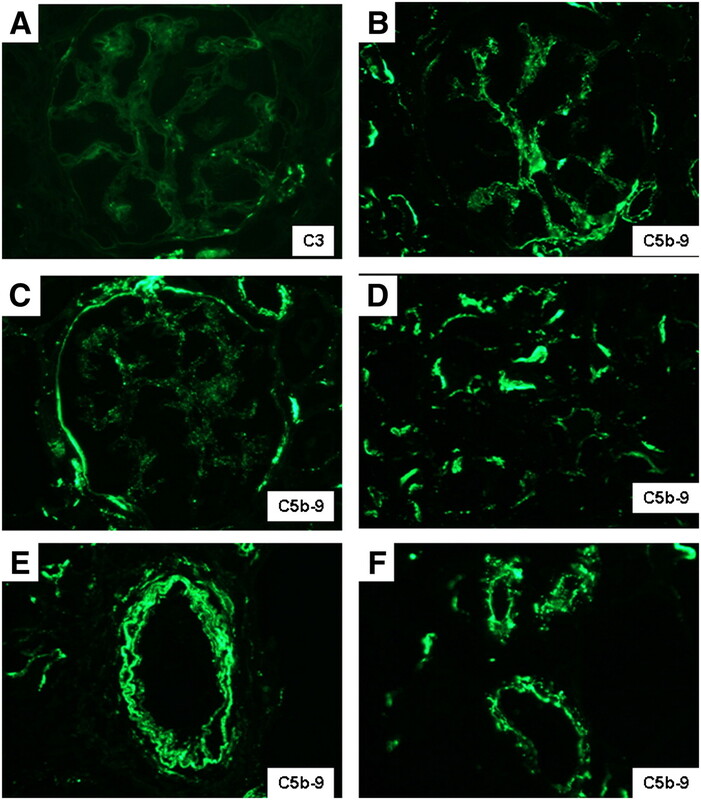 These findings suggest that C5b-9 is deposited extracellularly in normal kidney tissue, probably in the course of fluid fluxes across membranes of the glomerulus, tubules, and blood vessels, without causing histologic abnormalities or electron dense deposits. The intensity and quantity of C5b-9 exceeded the sparse staining for C3 typically observed in normal biopsies (Figure 5A), supporting the concept of low level activation of C3 in aqueous environments by the so-called “tick-over” mechanism, which leads to C5 recruitment in the fluid phase.15 These physiologic levels of C5b-9 activation in the course of normal glomerular filtration and tubular function could explain the propensity for deposits to form in glomeruli and TBMs in patients with complement regulatory disorders. Immunofluorescence also revealed a unique pattern of staining for Ig. By definition, patients with C3GN and DDD do not have significant staining for any Ig heavy chains or light chains. Interestingly, after treatment with eculizumab, all patients showed variable degrees of glomerular, tubular basement membrane, and vessel wall staining for IgG and κ light chain, with absence of all other heavy chain classes and λ light chain. The presence of κ restriction suggested a monoclonal process. We next performed IgG subtype staining, which revealed 1+ positivity for IgG2 and 2–3+ staining for IgG4. Because this finding was restricted to post-treatment biopsies, we considered the possibility that it represented tissue binding of the humanized eculizumab mAb itself. Eculizumab has been engineered to target C5 while minimizing its own potential to elicit an inflammatory response. Accordingly, the C5 specific variable regions were fused to a κ light chain and a hybrid heavy chain created from portions of IgG2 and IgG4 (Figure 6). The IgG2 constant region 1 and hinge region were chosen because they do not bind Fc receptors or activate complement. IgG4 constant regions 2 and 3 were selected for their inability to activate complement.15 The presence of staining exclusively for IgG2, IgG4, and κ are exactly what would be detected if eculizumab were being deposited in tissues, which we propose is the explanation for our findings. We also tested pretreatment and post-treatment biopsies on a patient with aHUS who received eculizumab. Despite the absence of glomerular electron dense deposits, this patient also developed IgG-κ deposition in a distribution similar to that seen in the DDD and C3GN patients. The distribution and characteristics of the IgG-κ binding are similar to what is seen in MIDD due to dysproteinemia.16 Two of the post-treatment biopsies (C3GN1 and C3GN2) also displayed the finely granular, powdery type of electron dense deposits seen in MIDD, again suggesting an effect of eculizumab binding to C5 deposits in glomeruli, TBMs, and vessel walls. The clinical significance of the binding of eculizumab to renal tissue is unclear. Long-term eculizumab use has been studied in patients with PNH and there is no evidence of the development of proteinuria and renal insufficiency that is typically seen in MIDD.17 Nonetheless, the same design features of eculizumab that make it anti-inflammatory could also inhibit its clearance from sites of tissue deposition by blocking the usual routes of elimination via the Fc-γ receptor and complement receptor bearing leukocytes, thereby promoting its accumulation in tissues over the course of prolonged therapy. In conclusion, eculizumab therapy in patients with C3GN and DDD is associated with reduced glomerular endocapillary proliferation and neutrophil infiltration in the majority of patients studied, particularly those who manifest other clinical evidence of response. The decrease in neutrophil infiltration may serve as a useful marker of histologic response in future studies. Importantly, treatment does not appear to be associated with a significant diminution in staining for C3 or C5b-9 or a resolution of glomerular electron dense deposits after 1 year of therapy. 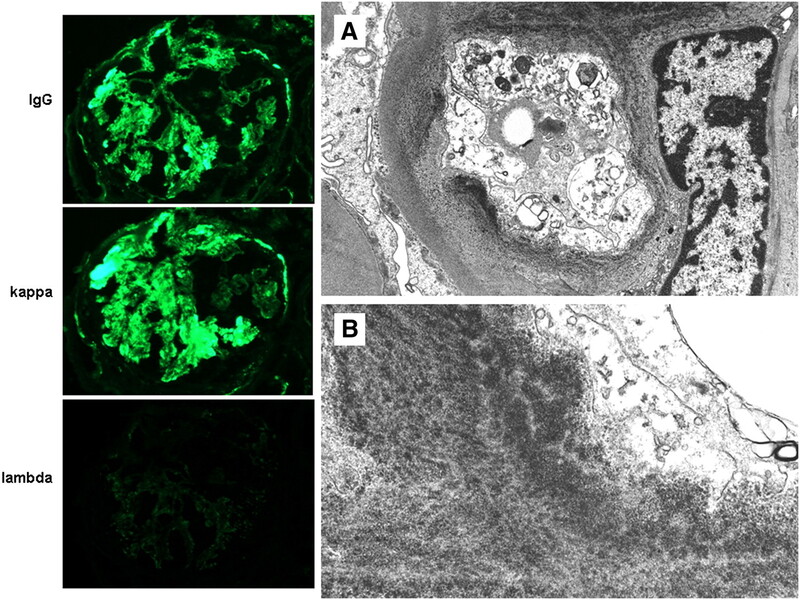 Eculizumab appears to bind to and deposit within glomeruli, TBMs, and vessel walls of treated patients, and the resulting distinctive immunofluorescence findings should not be misinterpreted as a transformation to immune complex-mediated GN or MIDD. The long-term clinical significance of this drug-tissue interaction is unclear and requires further study. Six adult participants, three with DDD and three with C3GN, were enrolled in an open-label, nonblinded, proof-of-concept, efficacy, and safety study of eculizumab (Soliris; Alexion Pharmaceuticals, Cheshire, CT). Inclusion and exclusion criteria are detailed in a separate clinical manuscript.14 Chief inclusion criteria included a pretreatment renal biopsy performed within 6 months of enrollment with diagnosis of either DDD or C3GN and the presence of proteinuria (>1 g/d or 24-hour urine collection) or ARF (defined as a ≥50% rise in serum creatinine from baseline). Participants received 900 mg of eculizumab intravenously once weekly for 4 weeks, followed by 1200 mg intravenously on week 5 and then 1200 mg intravenously every other week up to week 53. This study was approved by the Institutional Review Board of Columbia University Medical Center and is registered with ClinicalTrials.gov (NCT01221181). Laboratory measurements were performed monthly during the study period and are detailed in the companion clinical manuscript.14 Primary endpoints were a reduction in urine protein excretion for those participants enrolled for proteinuria and a reduction in serum creatinine for those enrolled for ARF. Secondary endpoints included histopathologic changes in a biopsy performed after 1 year of treatment, which are detailed in this manuscript. Data are presented descriptively, because the small number of participants and study design preclude formal statistical analysis. Biopsies both before and after treatment with eculizumab on four of the enrolled patients (DDD1, DDD3, C3GN1, and C3GN3) were processed at the Renal Pathology Laboratory of Columbia University. One patient had his pretreatment and two post-treatment biopsies processed at Massachusetts General Hospital (C3GN2). One patient (DDD2) refused post-treatment biopsy and is not evaluated in this manuscript. Renal biopsy samples were processed using standard techniques for light microscopy, immunofluorescence, and electron microscopy. For light microscopy, multiple serial paraffin sections were stained with hematoxylin and eosin, periodic acid–Schiff, Masson trichrome, and Jones methenamine silver. Standard immunofluorescence was performed on 3-µm cryostat sections using polyclonal FITC-conjugated antibodies to IgG, IgM, IgA, C3, C1q, κ, and λ (Dako, Carpinteria, CA). Immunofluorescence staining for the IgG subtypes (IgG1, IgG2, IgG3, and IgG4) was performed using FITC-conjugated polyclonal sheep antibodies (The Binding Site, Birmingham, UK). Staining for C5b-9 was performed by indirect immunofluorescence using a monoclonal mouse anti-human antibody (clone aE11) followed by FITC-conjugated rabbit anti-mouse secondary antibody (F0261) (Dako). Ultrastructural evaluation was performed according to standard transmission electron microscopic techniques. Six normal renal biopsies were used as negative controls. 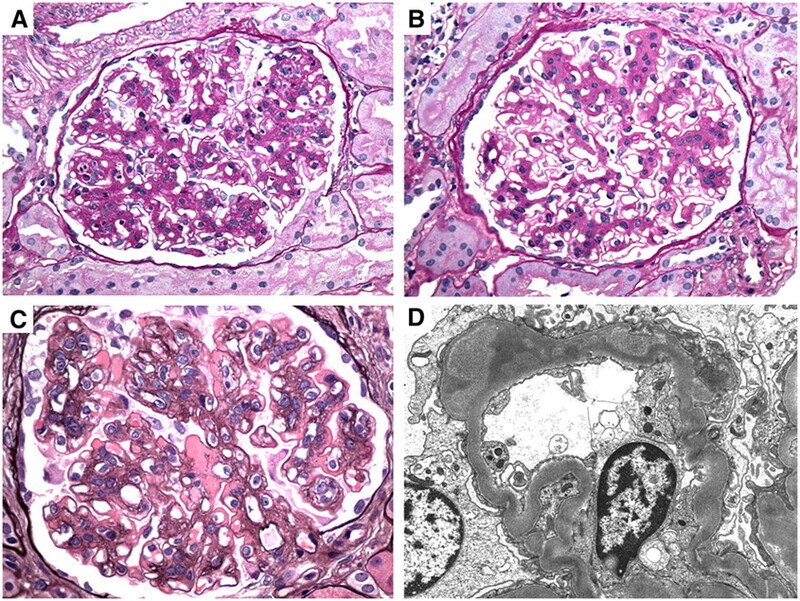 Biopsies with primary membranous glomerulopathy and active lupus nephritis served as positive controls for C5b-9 staining. Findings by light microscopy, immunofluorescence, and electron microscopy were scored by group consensus of three renal pathologists (L.C.H., G.S.M., and V.D.D.) for severity, intensity, and distribution on a semiquantitative scale (0–3+). Specifically, for light microscopy, the 0–3+ scale was based on the proportion of glomeruli or percentage of cortical area displaying the described lesion with 1%–25% involvement described as 1+, 26%–50% involvement as 2+, and >50% involvement as 3+. For immunofluorescence, the 0–3+ scale refers to intensity of the staining (negative, mild, moderate, or marked), whereas distribution is separately described as segmental/patchy (involving <50% of the glomerulus or tubulointerstitial area) or global/diffuse (involving ≥50% of the glomerulus or tubulointerstitial area). For electron microscopy, the distribution (segmental or global) was specified as described above, and the prominence of the deposits was graded 0–3+. The pathologists were not blinded to whether biopsies were pretreatment or post-treatment. R.B.C. and G.B.A. have served as consultants to Alexion. The clinical study was supported by Alexion Pharmaceuticals, manufacturer of Soliris (eculizumab); however, the pathology specimens were processed independently, without any financial support from Alexion. This article contains supplemental material online at http://jasn.asnjournals.org/lookup/suppl/doi:10.1681/ASN.2011121186/-/DCSupplemental.